Last October, the terror attack in downtown Manhattan that claimed the lives of multiple pedestrians reaffirmed the need for improved pedestrian safety. Various safety initiatives are focusing on older New Yorkers. 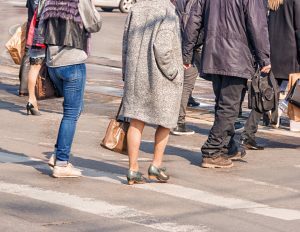 According to New York City Department of Transportation (DOT) statistics, the fatality rate for pedestrians over 65 who are involved in traffic accidents is four times the overall rate. Seniors make up 13% of the city’s population, but 39% of pedestrian traffic fatalities. Therefore, Metropolis has become especially mindful of Safe Streets for Seniors, the DOT’s pedestrian safety initiative for older New Yorkers. The program studies crash data, conducts outreach, and develops and implements mitigation measures to improve the safety of seniors and other pedestrians, as well as all road users in New York City. The DOT has evaluated pedestrian conditions in 41 Senior Pedestrian Focus Areas (SPFAs) in the five boroughs and has implemented safety improvements. These measures include extending pedestrian crossing times at crosswalks to accommodate slower walking speeds, constructing pedestrian safety islands, widening curbs and medians, narrowing roadways, and installing new stop controls and signals. In most cases, these improvements will not affect existing buildings, but they could lead to additional safety recommendations or requirements for new buildings, or those undergoing renovation. Metropolis is keeping close watch on any possible regulatory changes. Since the program began, annual senior pedestrian fatalities have decreased by 16% citywide, from an average of 65 senior fatalities per year between 1999 and 2007 to an average of 54 between 2008 and 2016. Since 2009, 182 Street Improvement Projects (SIPs) have been implemented within the SPFAs citywide. Of the total, 121 SIPs have at least two years of post-implementation crash data available for analysis. Analyzed together, these 121 projects have produced a 15% decrease in pedestrian injuries and a 9% reduction in total injuries. The DOT receives ideas and feedback in these study areas via presentations and workshops at senior centers and community boards. The DOT has also partnered with NYC Department for the Aging to coordinate outreach and share resources. Metropolis Group continues to coordinate with relevant agencies during this process. Please contact Metropolis at 212.233.6344 if you have any questions.